Delicate peony petals joined together with soft heliotrope bloom warmed with notes of oud wood, vanilla flower and musk completes this floral arrangement. Wow! The moment I popped off the lid to smell the wax… a heavy and powdery floral scent drifted all around my face. Just based off cold sniff, I had a feeling this would be one strong fragrance. I was actually a little hesitant melting it. Not one person in my home likes floral so I knew I would have a lot of unhappy campers in my house. LOL!! The fragrance itself smelled really pretty for a floral scent. 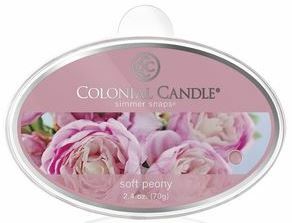 I’ve tried peony scents in the past but usually blended with vanilla or coconut to taper down the floral. This scent was solid flowers… like I was putting my nose into a freshly cut bouquet of peonies. I did detect the hint of musk the description describes too so we’ll see how it goes. I used the entire simmer snaps in 2 electric melters in my great room dividing the wax equally. Once melting, it literally took seconds before the fragrance was traveling through my great room and it was STRONG!! Within 10 minutes, the scent overpowered literally everything I had going in my own… upper and lower level. WOW!! The aroma… a really beautiful floral scent. I personally didn’t care for it but I could still appreciate it’s beauty. It reminded me of flowers and perfume combined. A scent I would imagine smelling in a french boudoir. Very feminine, delicate and 100% floral. Strength – These melts were strong. 10/10 in any size room. Not sure about the candles but my guess would be medium/strong. In closing, even though Soft Peony wasn’t exactly my cup of tea, I still appreciated it as much as I was able to. If you love floral scents, definitely give it a try… it’s a powerhouse.